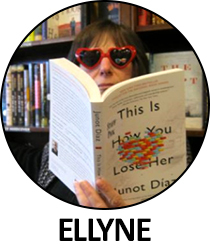 Ellyne has helped as a bookseller at The Bookloft for over 10 years, and loves literary fiction. Lucia Berlin's stories are gritty, 3-dimensional and incredibly satisfying. If you have not read her before, you're in for a treat. So happy this author has been rediscovered! Don't let the slimness of this book deceive you: it is filled with both pathos and beauty. The story pivots around the relationship of three people, one of whom is dead, and one of whom is waiting to die, while the third waits for release. Here, as in our lives, emotions reflect the good and the bad, with love, grief, and friendship sanding the sharp edges of sadness. My respect for Ackerman as an author grew exponentially. Read this in a sitting or two and I'm sure you'll agree. This was a joy to read: an adult book with nuance and depth, as well as gentle humor; a book about writing, writers, students and readers. A woman's best friend commits suicide and we are priviledged to hear her conversations with her departed friend, and the evolution of her relationship with his dog, who, when he dies, she inherits. She lives in Manhattan in a 500sq ft apartment in a building that does not allow pets. The dog is a Great Dane. Imagine. If you are looking for a book that will bring delight, this is it. A clever killing in each story - some victims deserving and others - really? was killing the 'right' punishment? (Is it ever?) Still, I missed her as a lunch companion once I had finished the book! A little book, a little fun. Who could it hurt? Ha! Just read and find out. And keep in mind: no matter how moral we are, we all have that moment where someone does something and we think...well, you know.. Her first book since 2006, I loved this collection, felt pulled in and tilted 90 degrees, seeing things clearly, but from a different perspective. Magical, but not magical realism; subtly political; delicious. I was probably won over well before I was almost run over by a gang of turkeys; but gangs, flutters, bellowings and ostentations, I believe, will win anyone over. You'll find a harem of seals and a "charm" of illustrations offset by the author's musings...a memory of elephants...a - I'll stop! FYI, no turkeys in this book, but turkeys are a crop, a dole, a posse, and a raffle, in addition to being a gang. Recommended to me by a customer who shares my taste in books (as well as my name, but without the weird spelling), this one could not be more timely; beyond that, it is beautifully written with a protagonist who fully engages the reader and a host of satellite characters emotionally and physically representative of a continent. It certainly was difficult to be so aware of what is/was happening in real life, but at the same time, it was lovely, for the moment, to exist in this book which somewhat reflects real life. Max Brod hated the word 'Kafkaesque', yet what else can one call the story of Kafka's papers and how they ended up, many of them, in a Tel Aviv apartment 'living' with one woman and a lot of cats? Having read a wonderful article written by Elif Batuman some years ago in the New York Times Magazine about this very subject, I was hooked the moment I saw the title. The question before the Israeli court: where should the papers reside if not on Spinoza Street with Eva Hoffe and her cats? Whose papers are they, given that Kafka asked that they be burned? P.S. At age 85, Eva Hoffe died on 8/4/2018 leaving no heirs. 16 wonderful stories by Kathleen Collins, who died in 1988 at the age of 46. What a loss! These stories are complex, graceful, and fluid. They are unflinching, but never mean-spirited. I'm sure they were radical in their time and although they should not be today, I found them so, nevertheless. Not harsh, but crisp and clear-eyed. Oh, try them! You won't read just one! If you liked Norwegian by Night, I think you'll like American by Day. Haven't read the first one, that's okay, too. It's difficult to find escapist reads that are 'lit-light' or close to it. Here, a Norwegian detective comes to America to find her somewhat-estranged brother. She ends up working with a quirky U.S. counterpart which creates some romantic and lighter moments. Some will be put off by a few pages of educatative writing on race. Me? I liked it, thought it was well done and in keeping with the story. I whiled my time away, having no desire to do anything but escape into this book! We've all had a glimpse of our mortality, but O'Farrell's 17 essays, all brushes with death and each related to a body part, serve more than a reminder of those moments. I was gripped by many of the events, found others totally recognizable, and still others - connected to her daughter - both heartbreaking and totally uplifting. Then there is the prose: a successful novelist, O'Farrell here becomes a lyrical writer of her own life, a life lived in danger as well as in the mundane every day. She makes it all important and we come out the wiser for having read about a precious life, or how precious life is. After I finished reading this book, I realized that the main character, Jojo, was so real to me that I felt like he was bearing witness in a memoir. And, of course, the experiences Ward writes about were real: Parchman IS real, race is real. Is the Bardo real? Odd to have read two books where souls are suspended, waiting for release, odder still, both "Lincoln in the Bardo" and this book worked for me. The stories that these spirits tell bear witness, too, in a most powerful way. If Jojo can evoke the past, he can also give us hope for the future. An excellent writer, McBride creates characters - and plots - that carry us to the small spaces between what is and what we think we know, that challenge us to explore, and that surprise us! These stories are definitely gems, perfectly formed and full of soul, wit, and pathos. A man struggles to get safe passage to America only to be faced with the existential angst immigrants so often experience. His solution: to return to the Middle East to fight in Syria with the Free Army. The story begins when Haris Abadi reaches the border. With occasional trips to a backstory, we follow him and those who people his life as he moves his journey forward. We feel the authenticity, and, indeed, the author is a military vet who served in Iraq and Afghanistan and who also reported from the story's locale. Perhaps a companion piece to Hamid's "Exit West"? With North Korea in the news, you may be wondering what life is really like over there. These stories by Bandi - nom de plume for a writer who still lives in N. Korea - will give you a clear view, taking you into a nation where the absolutely absurd is the norm. How the manuscript for this book made it out of N. Korea is a story just as wild as the stories Bandi wrote, and can be found at the end of the book. Tessa Hadley's blurb on the back of the book: It's perfect. I can only add that after you finish, or even while you're still reading, some little thing will happen - you'll notice that your pants are loose or your supermarket will stop carrying the brand of coffee that you usually buy - and you'll think about what Rachel Cusk could do with that "event." And then you'll absolutely tingle with the realization of how magical her ability is to take everyday events and connect them deeply to the pathos that is life. You'll wonder how she does it and you'll want more!